I had this wonderful dish for the first time while in Bath. It is just divine, if slightly high on the calories. Traditionally from the SAvoie region of France, it was re-developed by the cheese-maker Reblochon with great success. 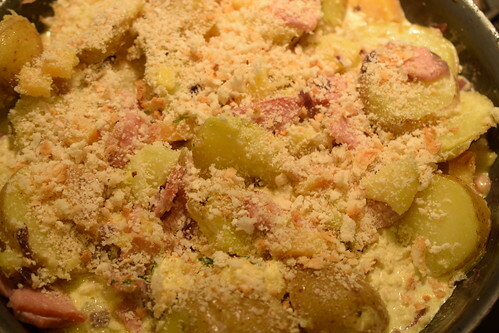 Tartiflette was first mentioned in a book of 1705, Le Cuisinier Royal et Bourgeois written by François Massialot ( a VERY important chef in his day) and his assistant B. Mathieu. 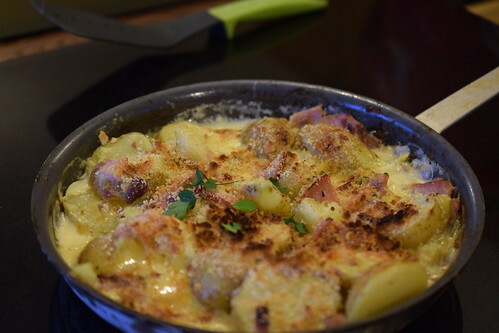 A very popular dish in ski resorts, I think I’ll put it on my meal planning for my Swiss Cooking Adventure. Method: Peel and thickly slice the potatoes into 1.5cm slices. Boil these in salted water for 6-8 minutes until just tender, then drain. While the potatoes are boiling, heat the oil in a large frying pan. Fry the onion over medium heat until it becomes almost transparent. 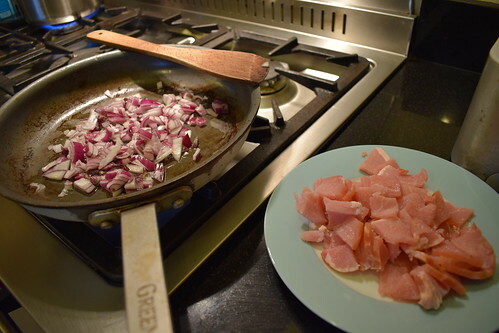 Add the bacon to the pan and carry on frying for 5-7 minutes, stirring occasionally, until the onions and bacon are golden in colour. Heat the grill to high. Add the potatoes to the onions and bacon, and brown the potatoes briefly. 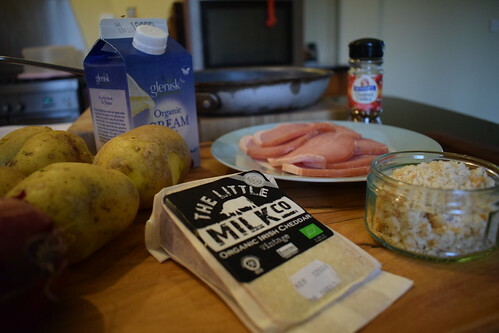 Nestle the chunks of cheese among the potatoes and bacon and drizzle with the cream. Sprinkle with the chilli if using, then evenly scatter with breadcrumbs. Grill for about 5 minutes until the top is lightly browned and just on the point of bubbling.